I’ve been desperate to try an electric car for ages. A friend of mine bought one recently, and was absolutely singing its praises – not least for the £6k she saves on petrol and taxes each year. Six grand, people!! In the blink of an eye, electric cars have somehow gone from being a never-gonna-work experiment to a mainstream choice, so it feels like the perfect time to review the BMWi3, billed as the world’s first premium electric car. Shall we? 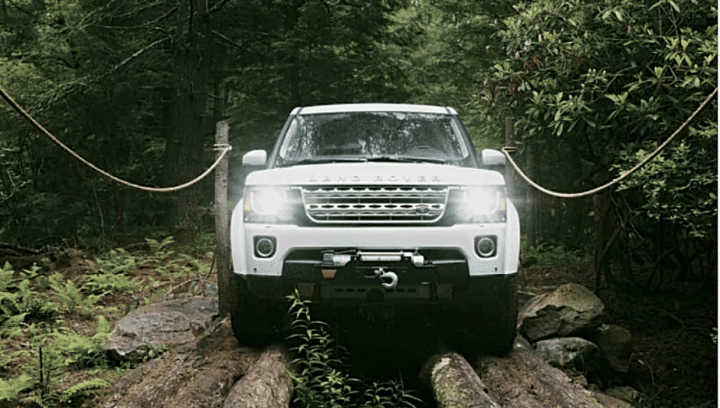 The basics: Launched in late 2013 and gathering momentum like a car going downhill without brakes (oh, bad analogy? 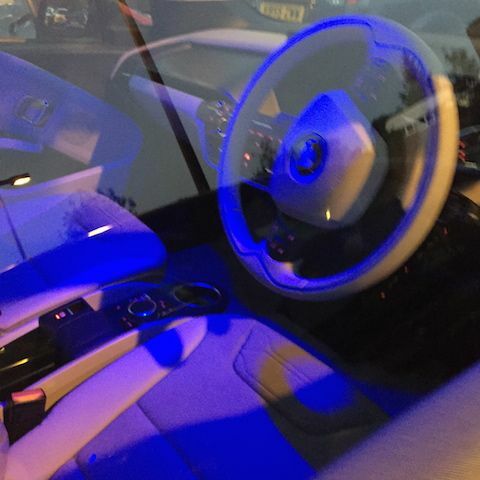 ), BMW’s electric car is a four seater, four door car. The back doors open forwards (the opposite way to a normal car if you get my drift) which feels weird for a nanosecond until you realise how much easier it is to get the kids in and out of the car. 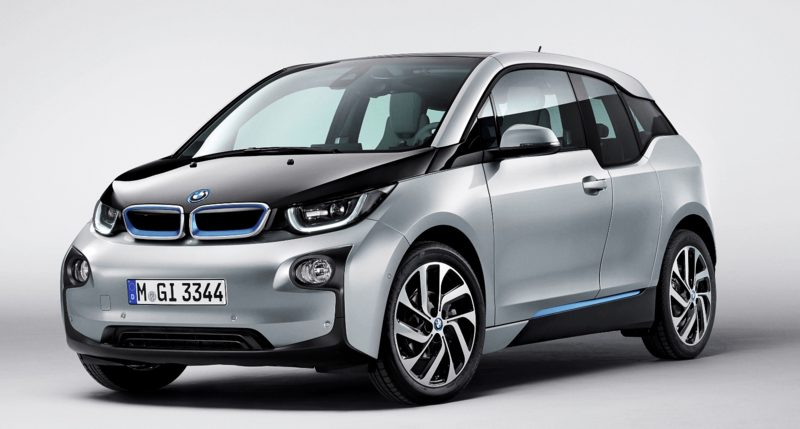 There are two i3s – a fully electric version, and a petro range-extender version, which is the one I road-tested. Both have one thing in common – they look the business, don’t they? 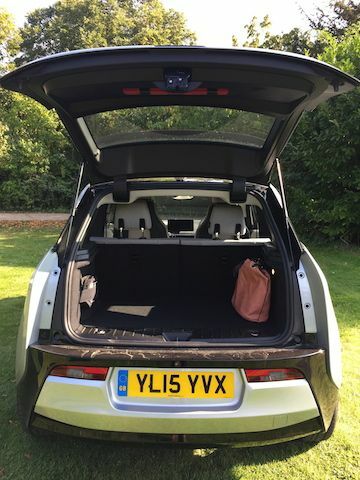 But the i3 also goes like the clappers, doing 0-60 in 7.2 seconds for the electric, or 7.8 for the i3 with range extender – yes you read that right – and up to 93 miles an hour at the top end (so *cough* 23 miles an hour faster than you’ll ever go). Plus really sticks to the road when you’re zipping through the country lanes and holds its own for short motorway journeys. It’s fun to drive, that’s for sure. Or maybe ‘no-surprise-surprise’ in this case to learn that the eco-friendliness extends past the electric battery to the construction itself – predominantly carbonfibre reinforced plastic and aluminium. It’s not a particularly slick look inside (the carbon has a kind of unrefined texture that you’ll love or hate), but the dashboard/ general feel is fresh, simple and non-gimmicky. 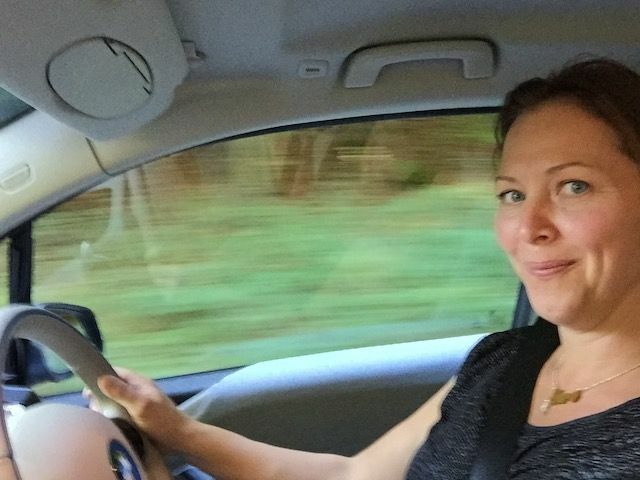 You can fit kids easily into the back of the car – my 6 and 8 year old were like pigs in muck – but clearly this kind of car is not designed to be carrying four adults for any length of time, so maybe bear that in mind if your kids are turning into lanky teenagers very soon. 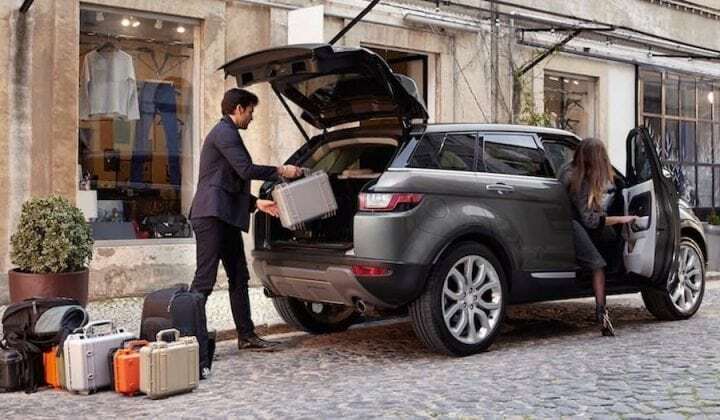 The boot is on the small side I’d say – fine for a weekend away and every day use but not for four large suitcases on the way to the airport. The big mental hurdle for potential EV buyers (see what I did there with the lingo – Electric Vehicle if you’re asking) is the fear that your car will decide to run out of charge when you’re in the outside lane of the M40. The all electric i3 has a 80ish mile limit (cue sweaty palms), but the range extender version allows you to tap into an extra 75 miles. The petrol (only 2 gallons needed) helps charge the battery, so you know you’ve got 150 miles at your service. I can see that many more charge points will spring up massively in the next few years but at the moment you do need to be a bit organised to drive one of these cars, even with the range extender. It’s an overnight job (8 hours) to charge the battery on a domestic charging cable, or it takes 4 hours with a specially attached BMW wallbox at your home. A small service station will take you 4 hours to charge the battery, but the superduper big motorway services will zoop it up in a mere 30 minutes. Just long enough for a coffee, cake and a celebrity magazine guilt purchase. In years to come we’ll charge in our electric cars at night as we do our mobiles – almost unthinking. But I’d be lying if I didn’t admit to thinking much harder about where I was going, the distances involved and where my panic top up stations might be. That’s just the nature of the eco-beast. Yes, yes, don’t worry, we’ll do this fast! CO2 emissions are clearly a big fat zero for the pure electric or 13g/km for the i3 range extender (so still superlow). The passenger compartment of the BMW i3, is completely made of high strength carbon (as strong as steel but 50% lighter) to protect in the event of collision. 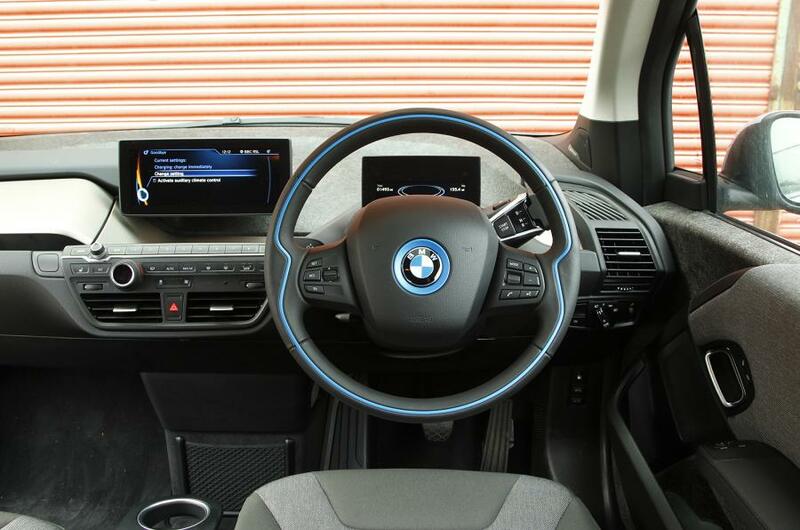 Part of the i3’s charm is that it feels like a very modern kind of car, high end but not unnecessarily faffy. Groovy little touches includes a natural brake on the accelerator pedal. Basically the moment you take your foot off the accelerator the car slows dramatically, so once you get used to it, you barely need to use the normal brake at all. The kids loved the neon lighting inside at night. Being a shorty, I appreciated the superwide, bright windscreen and the upright seating. I could see the end of the bonnet – miracle. ‘What else?’ I hear you cry (go on then). Well, there’s a whole computer system on board for navigation, all the usual smartphone integration blah di blah but I would say in its favour that it was really easy and intuitive to use. Loved the navigation search where you could just say where you wanted to go, or use your finger to write your destination on the middle knob (yeah that’s a technical term) for the computer to decode your letters. But the biggest selling point really, the thing that takes it from impractical eco dream to a real next purchase contender is its mileage booster. 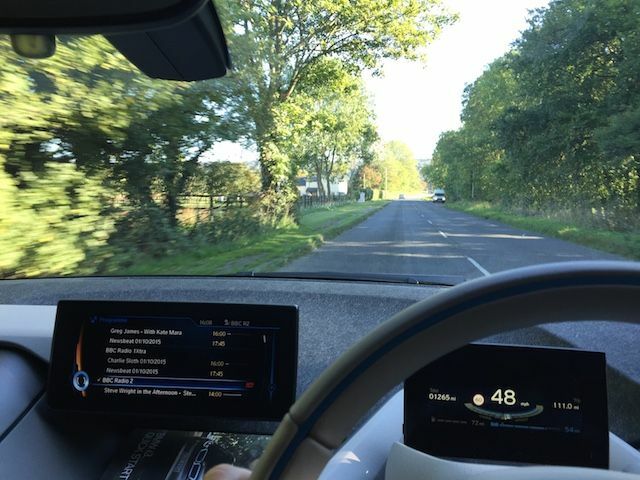 Having the back up of knowing you can go an extra 75 miles if necessary and in extremis use petrol to fuel your eco car makes the i3 a viable option for me, and might travel slightly further afield. Good for: City drivers, mums on the run or business types looking to drive short or middle distances in style and comfort. Its eco credentials are high, and its running costs incredibly low. Not for: Really long journeys. You might run this as you main car when you’re a couple, but once you’re lumbered with anklebiters (don’t forget the back seats only fit two! ), the i3 would act more as the runaround I think. 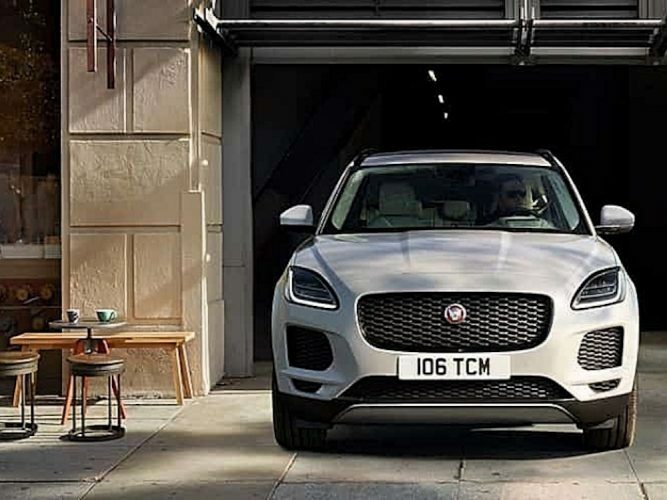 Some might not go wild for the bonnet design (there are slicker-looking BMWs on the market), the fact that the back doors won’t open without the front doors open first, or the potential hassle of remembering to plug the car in at night. £££: The entry level price for a BMWi3 is £30,980 for the pure electric version or £34,130 for the range extender (take 5k off both those prices for the government grant for being an eco-driver). It’s fair to say it’s on the expensive side for an electric car – or any car! – but the awesome driveability, eco creds and extended mileage on this little beauty has a good chance of winning you round. Good review, Hero. But even with HMG shoving £5k at me, I’m not even slightly tempted at those prices!